PLEASE CAN EVERYONE SHARE THIS FAR & WIDE…my cat has been missing from BS5 BRISTOL for too long now & I want to know she is SAFE & WELL. I keep being told stories of cats getting into vehicles & travelling the country..she is an adventurer & loves to hide in small spaces so WHO KNOWS WHERE SHE MIGHT BE!! Please check the obv sheds, garages etc…& listen out for constant meowing!! She’s very vocal! 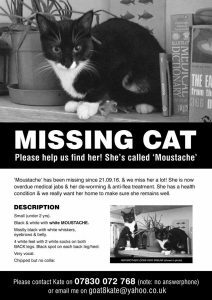 Moustache needs medical jabs & is overdue anti-flea & worming treatment. Owning a cat means more than just feeding them.